I had a few rays of sunshine today. The first was Mattey's awards program at school. She was recognized for making the honor roll and also for her good citizenship. Way to go, Mat! The second was the inspector said our house was good. Hooray. The third bright spot was this. I bought these at Meijer this afternoon. I could smell them as I walked up. We ate some with our pancakes and eggs for dinner. They tasted even better than they smelled. Thank you California for growing some good berries. Mickey said we needed to have some shortcake. I'll get right on that...tomorrow. P.S. I have come to the conclusion that I enjoy taking pictures of things that don't move. Sorry about the house. That's very disappointing! Good for you Mattey! 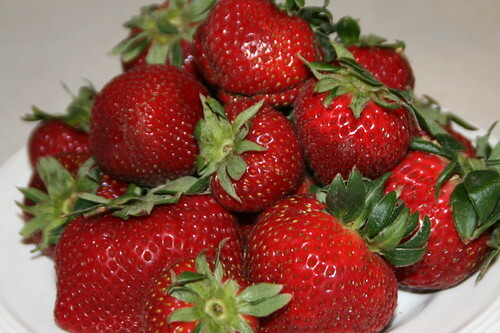 Those strawberries look wonderful, I may have to go get some!